When you feel accurately represented in what you're wearing, it frees you up to be fully present to what matters most. Together, let's uncover what that looks like for you! 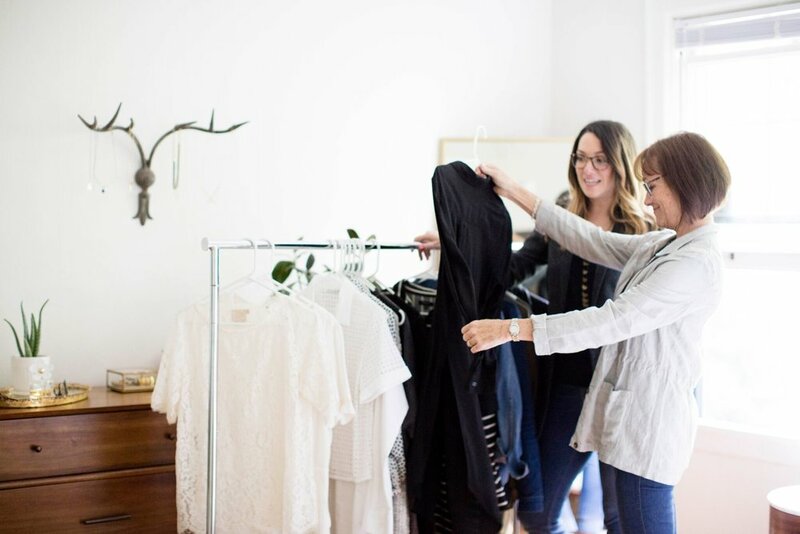 Alison Knox is a Personal Stylist and Wardrobe Consultant based in Portland, Oregon, making style easy and accessible for her clients both in Portland and the San Francisco Bay Area. She brings fun, passion, gentle honesty and an impeccable eye for style to each one-on-one session with her beloved clients. Working with Alison has changed my life in so many ways. That may sound silly, but wearing clothes that accentuate who I am makes a difference in how I and others perceive me. People noticed the change immediately and 10 months later still make positive comments about my clothes and how I look. She has a great sense of style, but also works to understand your style (or what you want it to be). SHE REALLY TOOK THE TIME TO GET TO KNOW MY LIFESTYLE AND HELPED TRANSLATE IT IN TO MY PERSONAL STYLE. SHE HAS A GREAT, EASY DEMEANOR AND WE SPENT A LOT OF OUR TIME TOGETHER LAUGHING! I LOVED ALL THE ASPECTS OF WORKING WITH ALISON, BUT THE BEST PART FOR ME WAS CLEANING OUT MY CLOSET. I FEEL LIGHTER AND MORE FOCUSED WHEN MAKING OUTFIT CHOICES. THANKS TO ALISON, FIGURING OUT WHAT TO WEAR IS NOT NEARLY AS DAUNTING AS IT HAD BEEN IN THE PAST. GOING SHOPPING WITH HER JUST FEELS LIKE GOING SHOPPING WITH A REALLY STYLISH GIRLFRIEND! I HAD A VERY DIVIDED WARDROBE (BASICS AND THEN SUPER WILD/FUN PRINTED ITEMS) THAT SHE HELPED ME BRIDGE INTO ONE COHESIVE WARDROBE. SHE GAVE ME GREAT LITTLE TIPS (SOMETHING AS SIMPLE AS CUFFING MY T-SHIRT SLEEVES) THAT HELP TAKE MY OUTFITS FROM FINE TO STYLISH, AND I FEEL LIKE EVER SINCE MY SESSION WITH HER, I ALWAYS LEAVE MY HOUSE FEELING STYLISH AND CONFIDENT! THE TRY-ON PROCESS WAS QUICK AND FOCUSED AND I CAME AWAY WITH GREAT CLOTHES THAT I WEAR WITH PRIDE AND RECEIVE ENDLESS COMPLIMENTS. I WOULD HIGHLY RECOMMEND THIS EXPERIENCE FOR ANYONE. THEY SAY IF YOU FORCE YOURSELF TO SMILE, YOU CAN END UP FEEL HAPPIER EVEN IF YOU START OUT SAD. WHAT CAN I SAY - NEW CLOTHES THAT MADE ME LOOK GOOD MADE ME HAPPY! Through the Sort, Shop & Style, you will enter your closet each morning and know that it’s only filled with things you know look great on you and that you truly love and feel confident in. 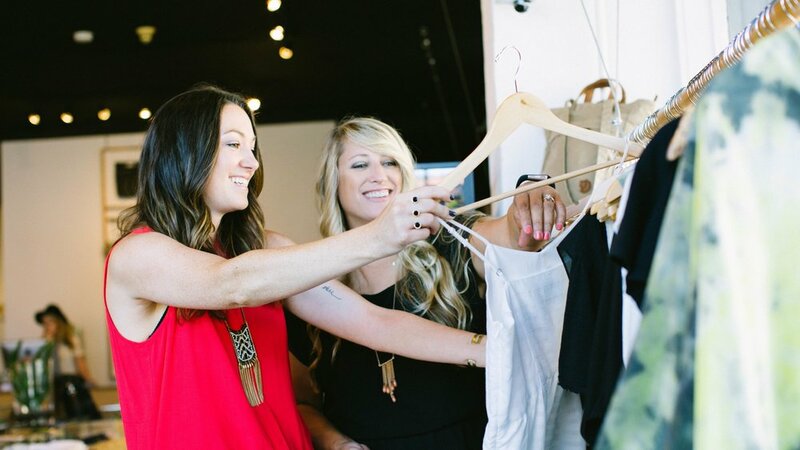 You’ve got a closet full of stunning clothes - let me help you put them together! This premier service keeps your wardrobe on the same page all year long.